out of her earnings she plants a vineyard." Today, let’s talk about cold, hard, cash. Money, honey. Many years ago, when I was a freshman in college, I read this book by Robert Kiyosaki titled Rich Dad, Poor Dad. I didn’t buy it, I just read it at the bookstore. There are so many self improvement books out there, I don’t buy any of them if I’m not really 100% that it would be a worthy investment. Flipping through the pages, I found myself nodding my head over and over in agreement with what they author said. Many points he expressed, I found to be what my parents taught me in the dinner table over the years when I grew up. My father has his own business, so he deals with managing cash flow on daily basis. One thing I have practiced on consistent basis since I was very little. You work hard for the money. So make the money works hard for you. As a little girl, I saved my money in the bank and I learned that my little saving generated a little bit of interest 24/7. My money was making more money for me even when I was sleeping! Isn’t that awesome! Then after graduating college and having my own income, I started to ask my money to work even harder for me, because I have worked hard to earn them. Also, investing is the only weapon one has against that “monster” called inflation. What is inflation? Let’s put it this way. A dollar now will not worth a dollar ten years from now. A dollar ten years ago, doesn’t worth a dollar today. It means you could buy a burger with a dollar several years ago. But you cannot get the same burger now with a dollar. If you plan to save US 10,000 for your childen’s education 10 years from now, you cannot save just US 10,000. Because 10 years from now, what costs US 10,000 now might have doubled to US 20,000. So you might have succeeded in your goal of saving US 10,000, but you won’t reach your goal to finance your child’s education. The only way to make your money works for you, even when you’re sleeping, and beats inflation, is investing. I thought I would share with you what I have done and seemed to work very well for me for more than 10 years and now also works well for my family. I’m not an expert, but these tips have been proven work very well for my parents – for almost 50 years - and myself. You will get interest, yes, but it cannot beat inflation, especially with tax. If you happen to be fortunate enough to be loaded with cash, just calculate whatever amount you would need per month – including bills, groceries, tuition, doctor, insurance, mortgage, rent, whatever – times six, in your saving account. That’s your piece of mind, knowing that you can survive for six months just from your saving if anything happens. I do with only three months of living expenses in the bank. The rest you should invest. I’ve heard many horror stories of people who lost everything and all their life saving in chasing the golden dream. They got caught up in dream investment that promise a truckful load of gold. Well, my Friends. If it sounds too good to be true, most likely it’s not true. If getting rich is so easy, we won’t have any poor in the world. There is no shortcut in getting rich. Greed is the perfect road to doom. Don’t put all your money in just a single investment, whether a very promising stock, insurance, or business. Spread them to two or three different things. That’s why I think mutual fund is perfect for novice investors. They generate enough return in the long run to beat inflation, they don’t depend on just one single stock, and they’re very low maintenance. That means if you lose your money in one investment, the other investment(s) can cover or minimize your loss. The price of gold, over the years, never goes down. If you are conventional, on the edge of retirement, or will need money in the next year of two – either to buy a house, to travel, etc. – just buy some gold. Not gold jewelry, mind you, because you will pay a lot for the craftsmanship. Buy gold coins. They don’t generate as much return as stock or even mutual fund, but they usually beats inflation and they are extremely liquid. You basically can sell them anytime. Gold can guard the value of your money. Do you know that our Moslem friends also knew this? In their Holy Qoran, it was quoted that you will need 200 grams of gold to be able to afford the hajj pilgrimage. The amount of money needed for hajj pilgrimage is much more expensive now that it was 500 years ago. But even today, you still only need 200 grams of gold, because the price of the gold always match the value of the money needed. Buy from reputable seller who has been around for at least ten years, to minimize the risk of buying counterfeit gold. If you are not an expert, it’s quite difficult to differentiate counterfeit from the real thing. Also, make sure that the seller is willing to buy back his own gold. If the seller refuse to buy back his own merchandise, well, then you can be sure that the goods are not good! Some people insist that they have nothing left to invest. Well, I personally don’t believe it. Most people can spend US 50 on new shoes, theater tickets, or a lavish dinner, but cannot find the same amount in their wallet to invest? Come on. It’s not “I cannot” but more “I can, but I choose not to”. Well, then, what about that yearly bonus? The birthday money you receive from your auntie, your parents, your child, your spouse? The extra money you receive from your blog? If you are in sales and you sell more one month, don’t just go out and celebrate. Take some of the excess money you receive and invest it. That way, you won’t disturb your monthly spending cycle. You can always save for that trip to Rome from your monthly income. Live with your main income, invest your extra income. Friends, if you have not, I urge you to start investing right now. Either in business, in mutual fund, in property, whatever. Even the Proverb 31 woman invested in buying a field and making a vineyard. If you are a regular reader of my blog, your might notice that my week recap has been missing for these last couple of weeks. The reason is quite simple: life got in the way of blogging. However, I still deem it important to write some highlights here and there, since my blog is also a sort of family journal and scrapbook. My highlight of June is that my son Michael can now talk on the phone! Well, he doesn't really talk, just makes some words here and there, but he could listen and understand what his Daddy or grandparents were talking over the phone, and it's such a nice way to communicate with him when his Daddy and Mommy are away at the office! It's simply delightful to listen to his funny little voice saying "Hewwwooo.... Mommy? Hahaha..." So cute! I'm guilty as charge as thinking every little accomplishment or progress of Michael as cute! Here are pictures of him talking to his grandma, or my mom in law. Hello, just stumbled upon here, and I read through your writings about money. Pretty much agree about investment thingies :) nice post and nice outfits as well. 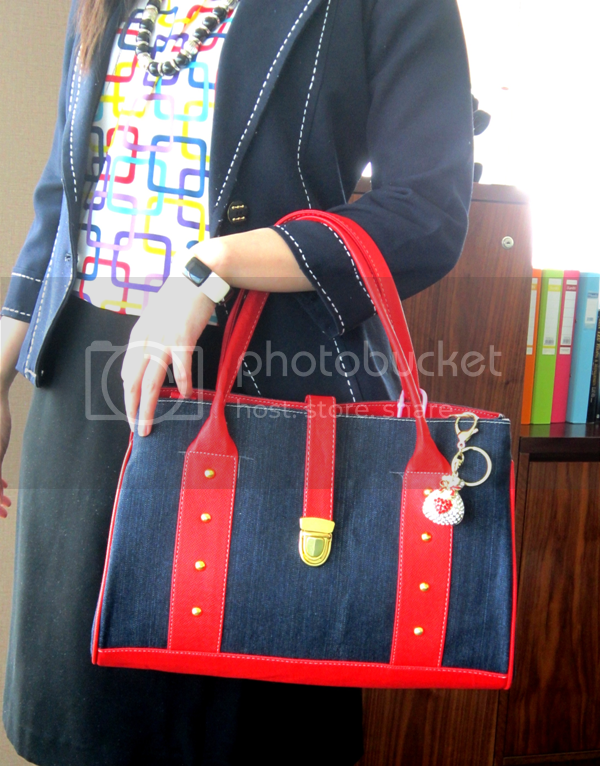 love the print on your blouse and great bag!